Basel holds the charming distinction of Switzerland’s cultural center, with the country’s largest concentration of museums. The Rhine River splits this Swiss city in two and close proximity to France and Germany have left an international flavor on Basel. 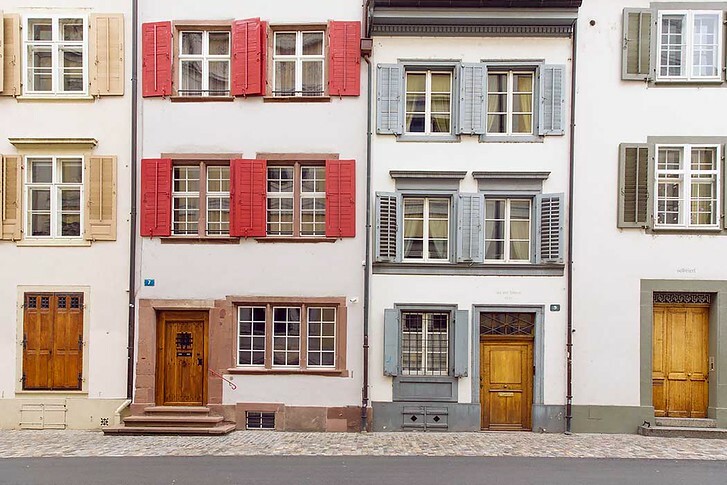 Whether you’re in town for Art Basel or a quick stay before a European River Cruise, you’ll easily fall in love with Basel’s medieval charm. Keep reading for recommendations on where to stay in Basel Switzerland! To summarize, here’s a handy chart of our recommended Basel hotels. All include free wifi and are known for comfort, good location and great customer service. This old world luxury hotel in Basel won’t disappoint! It’s location on the Rhine River provides unbeatable views, and staff compete to provide the best possible service. Grand Hotel Les Trois Rois has real European character and is within easy access of the city’s best sights. What makes this one of the best luxury hotels in Basel? Grand Hotel Les Trois Rois is guaranteed to provide a luxurious stay. From the in-room views of the Rhine River to a sumptuous buffet breakfast, every aspect of your stay is taken care of with style and exceptional service. Hotel Euler is a distinctive blue building dating from Basel’s history in the 1870’s. The property is well located just across Basel train station and rooms have been recently renovated. Why stay at this Basel hotel? Budget travelers will enjoy Hotel Euler for its cozy, clean rooms and prime location. While rooms can be cozy, the convenience of trams, buses and locations right outside the front door can’t be beat. Der Teufelhof hotel is made for art lovers. It’s composed of two historic buildings where rooms are decorated in distinct styles (see above). The hotel also offers its guests a free public transportation pass. If you’re looking for a great place to stay in the heart of Basel’s Old City, Der Teufelhof is a great choice. The hotel is within walking distance to all the best museums and room rates include both delicious breakfast and wifi. A modern and spacious hotel with a great on-site restaurant, perfect for business travelers. The Courtyard Marriott in Basel has a large on-site swimming pool and spa for travelers looking to fully relax. What makes this one of the best hotels in Basel? This hotel is located slightly farther away from the town center, but in return offers very large rooms and classic American amenities like walk-in showers, closets, ironing boards, etc that are typically not found in European hotels. Visitors are also provided with Basel public transportation passes to ease the pain of distance. Despite the twisty-turvy name, Steinenschanze is a centrally located hotel in Basel offering excellent value for the price. Rooms are simple and utilitarian, perfect for travelers planning to spend most of their time sightseeing. What book this Basel hotel? Steinenschanze Stadthotel is within walking distance of Market Square and boasts clean, comfortable rooms and helpful staff, eager to welcome you to the best Basel has to offer. And that’s it! Our guide to Basel’s best hotels to make the most of your stay. Whether you’re looking for ultra-luxurious comfort, the best location in town, or no-frills budget, these top Basel hotels are sure to please. How to spend 1 perfect day in Basel! Where to find the Best Hotels in Basel that won’t break the bank!